The world’s population is expected to increase by another two and half billion from current 7.3 billion by 2055. This means we will have 10 billion humans needing food, shelter, water, electricity. We need to face these issues in addition to climate and environmental changes. The result is more people fighting for space & resources and we will have no way of solving it. However, one potential solution is implementing smart city projects. Even government organizations across the globe had already started to plan and execute smart city projects to tackle the problem. So, how can you make a city smarter? Here, ‘smart’ indicates optimizing the usage of resources. Better optimizing will result in better distribution of resources without increasing the production mechanisms. IoT, Internet of Things is a unique technology that can help us optimize the usage. IoT technology offer insights about the resource consumption habits of residents and help us in streamlining them. For example, implementing IoT based smart water monitoring system will give us insights about the water consumption among the residents. And this help us in reducing leakage & wastage. Implementing this IoT technology alone will help us save huge quantities of water and provide an efficient solution to the water shortage problem. Similarly, we have other IoT solutions like smart home retrofits, connected smart kitchen, smart plugs, smart home energy monitors, smart ventilation systems etc. These systems will make our living smarter, help us overcome our habits and save resources efficiently. Now you know the importance of implementing such IoT based smart systems on cities. Moreover, having knowledge on these IoT based smart solutions will help you develop an exciting career. So, what is the best way to get skilled in IoT based smart devices? How can you integrate yourself with these smart city projects? One simple way - Developing IoT based smart city projects hands-on. Yes, learning to build IoT based smart city projects is a great way to get skilled on the technology. Since this is an upcoming technology, you can’t find the necessary resources in your engineering books or laboratories. So, you need to resort to online journals and forums to get necessary knowledge. If you are looking to build good smart city projects using IoT, this article will provide you with valuable info. Here are few of the best IoT based smart city projects which you can learn and build at your own convenience. With the boom in the electronics industry, the number of devices that we use in our daily routine had increased significantly. And all these devices need electricity to function. So proper energy management system should be implemented to reduce electricity consumption and save power. The objective of this smart IoT system is to provide an intelligent solution for saving power. The project that you develop can facilitate controlling of all home appliances via smart phone itself. By using this device, you can switch ON/OFF the electronic devices using an Android App installed on your mobile with Bluetooth technology. The IoT system will also send the data collected like device’s usage time, pattern and frequency to cloud for storage & analysis. This data will provide valuable insights about the power consumption and will be helpful in monitoring the electricity usage. With the urbanisation on the rise, municipal corporations are finding it extremely difficult to manage the domestic water consumptions. The challenge is not only to control the water usage but also to maintain uninterrupted water supply. Even transportation of water through the busy city streets is becoming more of a challenge now. To solve this efficiently, we need to develop a solution which can monitor the usage of water and intimate the corporation personals real time. Smart water monitoring system is an apt solution for this. The system uses a water flow sensor to detect the flow of water through the pipes and sends the data to the microcontroller for processing. The data collected will be sent to cloud for storage and analysis. Also, the date can help us predict the usage of water and also notify us immediately whenever there is a leakage. This will enable us to use water efficiently and stop the wastage of water. Now, almost all the houses are integrated with air conditioning and ventilation systems. These systems help in maintaining the temperature level in the living rooms. But they also consume a lot of power while doing so. These are the appliances that consume maximum electricity in a house and impact greatly on the overall energy consumption. Smart temperature monitoring system provides an efficient solution for this by tracking the temperature changes real time with the help of sensors. This IoT system uses DHT sensor to detect the temperature changes and sends the data to the microcontroller for processing. You can also program the system in such a way that, say whenever the temperature crosses a certain threshold value it will perform an actuation. The data collected will also be sent to cloud server for storage and analysis. Home automation system enable us to control all the electronic devices via mobile phone. But this process is not very efficient as the system is not automated. To provide an efficient solution for lighting management, we can make use of the PIR sensors. Passive Infrared sensors can detect activity and motions happening in front of it and sends the reading to the microcontroller. We can then program the microcontroller to switch ON/OFF the lights according to the readings received from the PIR sensor. This system enables automatic switching ON/OFF of lights according to the human presence. You can also modify the system to make it function as anti-theft alarming system, burglar detection system etc. Also, the data collected about the number of occupants, electricity usage will be sent to cloud for storage and analysis. You might have noticed that many street lights are left switched ON even during the day or they might be switched ON well before the required time depending on season. This is mainly because of the lack of automation system. And we had to manually control their lighting operation, which is not a very efficient way to manage it. To solve this problem efficiently we can make use of IOT and LDR sensors. LDR, Light Dependant Resistor is a component that gives value according to the sunlight intensity. We can use these readings to program the microcontroller to switch ON/OFF the street light based on sunlight intensity. This will help us save a lot of electricity that goes into the wastage. The system will also send the data collected to cloud which can be used to get valuable insights. With the increase in population, we will have a lot of mouths to feed and not many efficient methodologies are present to increase the food production. So, we need to redefine the way we do farming. Roof farming, vertical farming are some of the latest technologies which we started to experiment to increase the food production efficiently. And these methodologies are integrated with latest technologies to make them smarter and efficient. One such technology integration will be smart irrigation system. This IoT based system will have a soil moisture sensor which monitors the moisture level present in the soil real time and sends the data to the microcontroller. The microcontroller then actuates the water pump whenever the moisture level drops below a threshold value that we set. This process will help us save huge amounts of water and automates the irrigation process. The data collected will also be sent to cloud for storage and analysis. 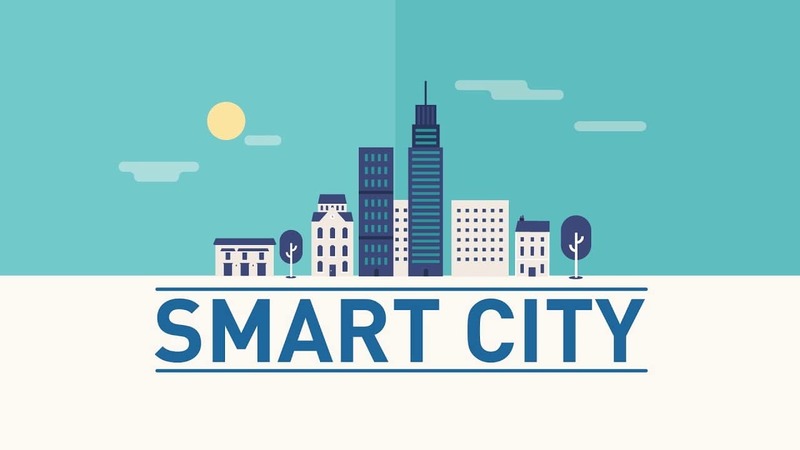 Hope you got some good insights about the Smart City Project using IoT from this article. Suppose, if you want to build great IoT based projects but don’t have the necessary technology knowledge, don’t worry! Also shoot out your queries by commenting below, we will assist you at the earliest.